The idea was for flags to be placed on the graves of all of the fallen heroes in hometown graves, and for some kind of public observance to be held in the cemeteries. It was always an exciting time for me and my friends because Decoration Day always marked the beginning of summer vacation time from school. 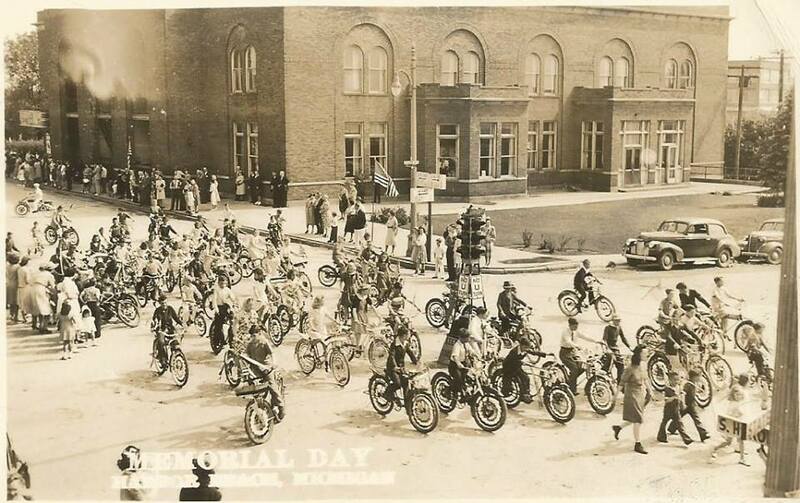 In our hometown we always had a parade. The high school band, the local veterans groups, and just about anybody else that wanted to march got to be in the parade through the town. We kids would decorate our bikes with red, white and blue crepe paper streamers and sometimes we had little flags taped to our handle bars. The parades always ended at the cemetery where the town dignitaries, representatives of the veterans groups and local clergy got up on a podium and gave speeches. That was the boring part of the affair for the youngsters because we did not have a full understanding of what the day was all about. Those were the years when just about every town had soldiers from the two great wars and the Civil War buried in their cemeteries, with surviving friends and relatives still living. For them, the act of visiting their graves and remembering them as heroes was important. World War II was, technically, America’s last declared war against a foreign enemy. The war machine we built during that conflict, however, was still in place, and the stage was set for constant warfare, whether Congress voted to send troops into battle or not. Thus we were plunged right into the Korean War, followed by the Vietnam War, and the wars in Iraq and Afghanistan. We also endured the long Cold War years with nuclear arms pointed at Russia and their missiles pointed at us. We lost a lot of good soldiers in Vietnam. I remember going to their homes as a news reporter and writing their obituaries for the newspaper I was working for in those years. I was amazingly deferred from having to fight in that conflict even though the draft was still active. I was not drafted because I was a college student when my name began flipping around in the tumbler at the draft board. The very week I was summoned for a physical exam for military induction I was involved in a serious automobile accident that hospitalized me for two weeks. It took me months to fully recover. The home town draft board seemed to forget I was even on their list after that. I have always thought that accident may have saved my life. A lot of my friends went to Vietnam and never came back. Instead of getting shot at in a jungle on the other side of the world, I stayed at home and wrote about all of the dead classmates and sons of friends what came home in body bags. I joined the young Americans that grew weary of war and questioned our reason for being in Vietnam at all. Because of the negative national sentiment, those soldiers did not come home as heroes. And after Vietnam Congress did away with the draft so America switched to an all-volunteer army. Decoration Day was changed to be Memorial Day and in 1971, the holiday was shifted from May 30 to the last Monday in May, thus turning the affair into a three-day free-for-all for workers. It then became an event that marked the start of the summer travel and spending season. It was all done for materialism. Few were left to remember or even think of the war dead. Oh, there are still parades and speeches given at the cemeteries. But the parades are not as grand and as exciting as they were when I was young. The marchers are usually members of the VFW and the American Legion, mostly overweight old men stuffed into uniforms that don’t really fit them anymore. Instead of gathering along the street to watch the parade and listen to the speeches, people are home roasting chicken wings, hot dogs or hamburgers on the barbecue and watching some athletic event on television. It’s a three-day weekend off from the slave job. For them thats about all that really matters. Wars aren’t fought now like they used to be. We don’t bring as many home in body bags, at least proportionately to the number of folks living in all the towns. Many of our veterans are coming home alive but extremely maimed or mentally damaged. Because of missing limbs they don’t march proudly in the parades, if they show up at all. And most folks are no longer convinced that their "sacrifice" was made in defense of the nation…..because it wasn’t. Alas, when the last veterans of World War II are gone, the real meaning of Memorial Day will be gone with them. And there is something very wrong about that.